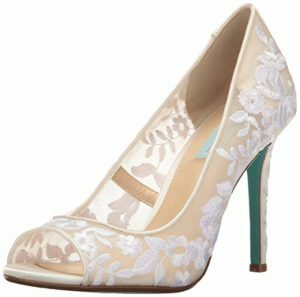 Look for some wedding shoes on a budget? There is so many different types of wedding shoes that are out there. You can do heels, flats, converse. Whatever shoe is most comfortable for you! Our latest fabulous find is something that some people may sometimes skip over. Everyone gets so excited and obsesses about the dress, that people often forget about the shoes! Even though your gown usually hides your wedding shoes, it’s still fun to get creative and add some pizzazz to your wedding attire. We found some great ideas to use on your big day. You will be spending all day in your wedding shoes, unless you bring an extra pair. If you are on a budget and looking for comfort, Amazon is a great place to check first! Simple and elegant Betsy Johnson dress heels. 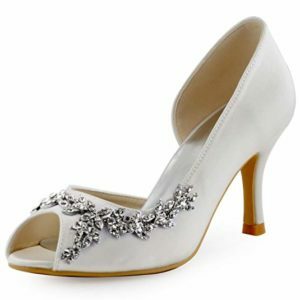 These are v traditional white or ivory wedding shoes that will look elegant with every wedding dress. If you are on a budget like most brides, shoes should not be one of the most expensive wedding items. Spending all day on your feet? Comfort and quality are important. 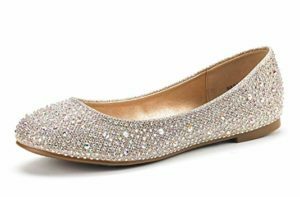 Rhinestone Ballet flats will light up the dance floor and be easy to dance in of course! These beautiful simple flats are available on Amazon along with all of the wedding shoes listed. Shoes come in all shapes, colors, designs, and patterns. Some brides enjoy the classic white satin shoes with minimal details. Other brides love bright colors and crazy patterns, and some even use it as their “something borrowed and something blue”. 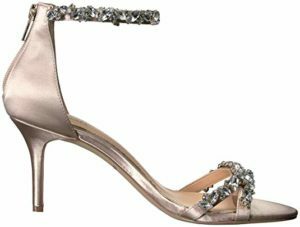 These Jewel Badgley Mischka dress sandals are not too high on the heel. They would be easier to walk in than tall heels and are perfect for the budget friendly bride to be. Having a hard time justifying an expensive pair of shoes that will be covered up by your dress all day? Don’t! 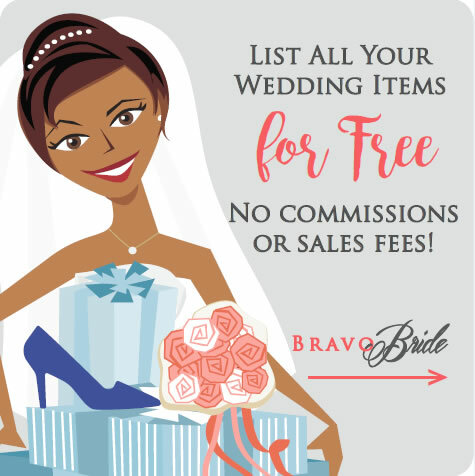 Bravobride and many other bloggers are here to help you match your budget. These shoes are budget friendly and beautiful. High heel platform shoes will make you feel like a glistening princess on your wedding day.